He risked it all to try and win the heart of Bachelor contestant Cassie Randolph. And it looked like his bet paid off, as Colton Underwood and the object of his affection enjoyed their first 'official' date as a real couple this Thursday evening. 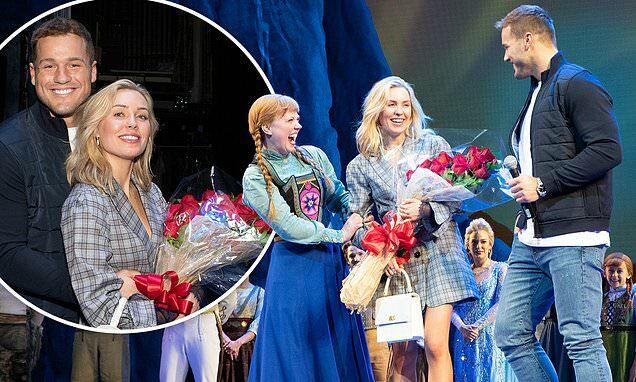 The new couple looked smitten while attending a sold-out performance of Frozen's Broadway adaptation. After the show the duo were even invited on stage by star Patti Murin, who plays Ann, for the curtain call. The crowd responded with cheers, already aware of the reality royalty in their midst. As they stepped onto the stage, the couple looked like the perfect pair. Cassie donned a leggy grey suit-inspired frock while Colton looked dapper in his usual uniform of a jacket, jeans and tee-shirt. Though Underwood was used to giving out the roses, this time Randolph received a beautiful bouquet from a pint-sized part of the cast. The pair were greeted with big hugs, before the former NFL player shared a few words. 'I didn't realize the parallels between Frozen and The Bachelor,' he said. Colton admitted he was 'madly in love' with Cassie while talking to People on Wednesday, after the pair's first public appearance as a couple.